It’s a simple problem with a not-so-simple answer. This two-year-old tried to solve it and while we’d award points for creativity, the solution left a lot to be desired. 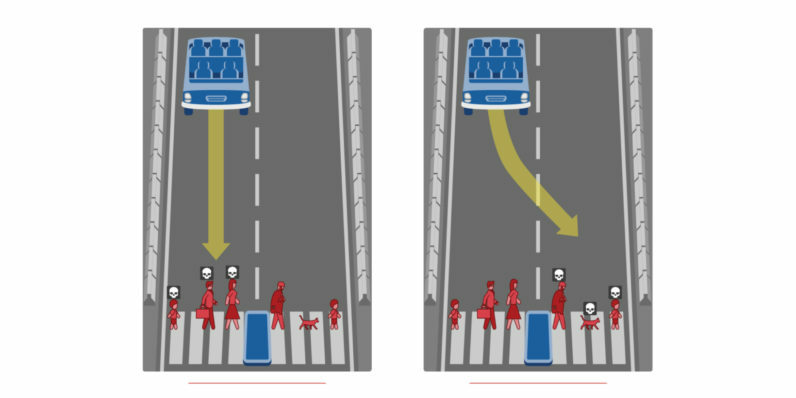 Moral Machine puts you in the shoes of a programmer that has to train a self-driving car in how to handle these uncommon scenarios. Of course, there’s only a tiny chance you’d ever run into one in your lifetime, but for the time being it’s a question without an answer. In the simulation, you’ll run into interesting scenarios. Is a human’s life more valuable than an animals? Should you run down two criminals and two innocent people or kill the driver and three passengers (all innocent)? Are the elderly worth less than the young? Is a female life worth more than a male’s? There’s really no right answer to any of these, but it’s useful in determining how humans feel the car should respond to these once-in-several-lifetimes occurrences. If you’re so inclined, you can even pass your results along to MIT at the end of the exercise. Self-driving cars will save lives — that’s not in question. Unfortunately, though, it’ll be responsible for a few along the way, and that’s an issue humans struggle with. While the car may have made the best decision based on the data available, to humans it’ll always be a machine that’s capable of killing without our input. And that’s a problem tech really can’t solve.